Bedford Blues have named their squad to take on Premiership and European Champions Saracens at Goldington Road this evening. 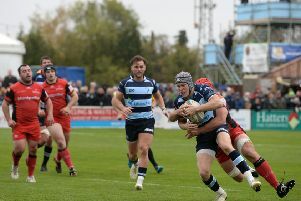 The game, which kicks off at 7.45pm, will be the first chance for Blues fans to see the new squad in action at Goldington Road while also having the opportunity to see both the Premiership and European Cups on display when Saracens pay a visit. Bedford racked up a convincing 66-14 win over Pontypridd last weekend but they know that a much tougher challenge awaits them on Friday night. Starting line-up: 15. Elliot Clement-Hill; 14. Pat Tapley; 13. Tom Farrell; 12. Michael Le Bourgeois (c); 11. Dean Adamson; 10. Jake Sharp; 9. Jordan Burns; 1. Jack Culverhouse; 2. Jacob Fields; 3. Christian Judge; 4. Ed Taylor; 5. Will Carrick-Smith; 6. Jason Hill; 7. Josh Buggea; 8. Ben Adams. Replacements: Camilo Parilli-Ocampo, George Edgson. Sam James, Dave Spelman, Mike Howard, Justin Blanchet, Tom Whiteley, Myles Dorrian, Ollie Dodge, Tom James.